Last year, we visited the orchard with Joe, Maria & the girls on a perfect October afternoon. Looking great in their coordinating burgundy & plaid flannel shirts, this family was ready for fall! These girls are hilarious & always so sweet & so much fun! Once their apple bags were filled, we moved the party over to the pumpkin patch. Isla & Juliana scoped out the pumpkins in the field before zeroing in on their favorites over by the farm stand. There is so much to love about fall in New England, but apple cider donuts are definitely at the top of our list! (Though, we have to make ours from scratch so they can be gluten & dairy free for Eric!) Seems like Juliana & Isla agree, and hanging out on the porch snacking on donuts with your sister is the perfect way to wrap up any session as far as we're concerned. The ladies loaded their pumpkins into one of the orchard's red Radio Flyer wagons and made their way back to the car just as the sun was setting. And that wraps up another wonderful Autumn day full of family fun in Easthampton! 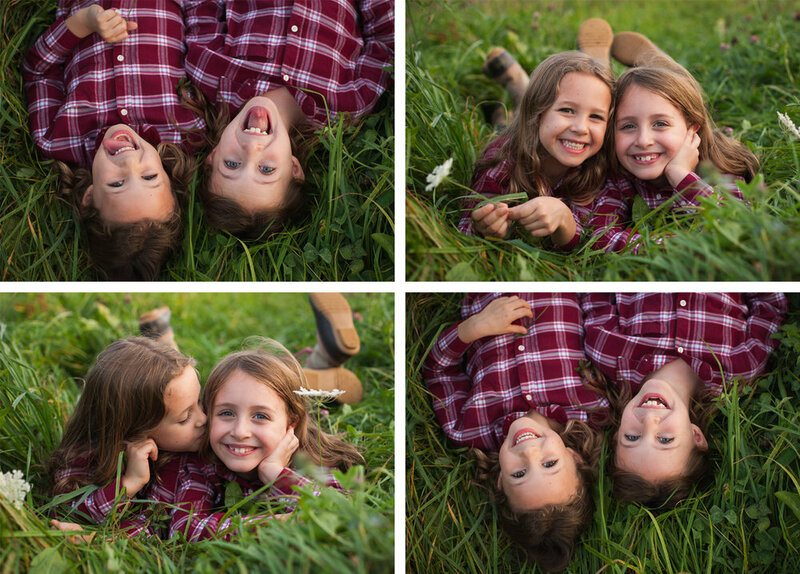 There's still time to book YOUR family's fall photo session with ibby & Eric this month! Get the family together & let's update your family pictures.